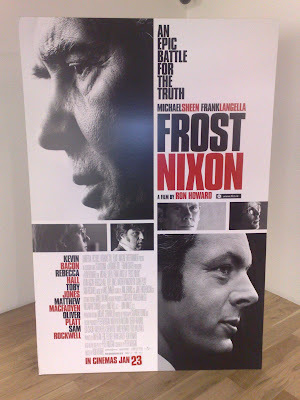 I saw Frost/Nixon in Dublin's Lighthouse Cinema last night. It opens on Friday. It couldn't have worked as a fictional story - it just wouldn't have been believable. Even if you know nothing of the history, the man who was Nixon or have little or no interest in US politics, the story behind the film is so strong that you couldn't make it up. The acting is superb. Just superb. Frank Langella plays Nixon as a tribute to him - he's uncompromising, personal, humorous and intelligent. Whether the intention or not, Langella's portayal of Richard M Nixon left me with a respect for Nixon, an understanding of what he was trying to do and who the man was. The best I can say is to ask you if you've seen Jim Carrey play Andy Kaufman in the 1999 film 'Man on the Moon'? Remember Carrey in the Mighty Mouse scene? Here's Kaufman in the original. It's virtually identical. That's how good Langella seems. It's funny. There are genuine laugh out loud moments. The dialogue is interesting, witty and intelligent. It doesn't assume you know, nor does it assume you don't. It seems faithful. It makes the interviews look interesting. I've never been inclined to look at them before but the way that Michael Sheen plays Frost and the interaction between his character and Nixon in this film - well, if it's only half the chemistry between the real life counterparts, the last part of the last interview must be truly great TV. Finally, probably most importantly, it's a damn great film. If you're looking for something with great dialogue, a brilliant story and interesting characters, this is it. The Academy has some challenge ahead in deciding this year's Oscars, that's for sure. Looking forward to seeing it. And 'The Wrestler.' And '...Benjamin Button.' And 'Slumdog Millionaire.' So little time. I bet this film is bloody brilliant, but it's such obvious academy awards fodder that it hasn't a chance... if that makes sense. Good stuff. I've been looking forward to this for a while and I'm glad it's getting good write-ups.